Can you believe Easter is right around the corner. 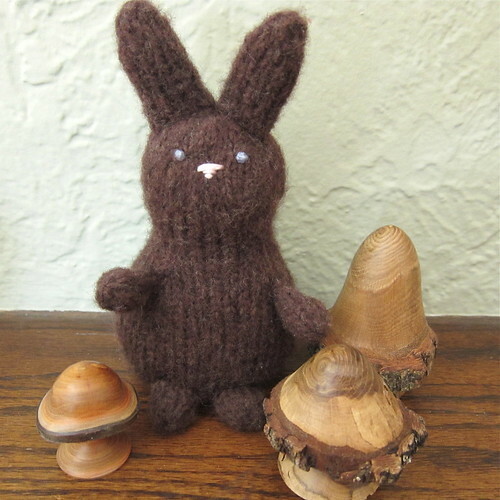 Ok, it’s a about two months off, but that gives you enough time to knit up a colony of these bunnies to fill a few Easter baskets. This chocolate bunny is perfect for cuddling and won’t go to your thighs. 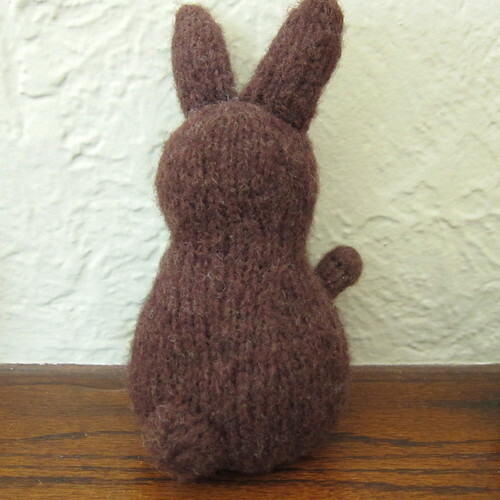 I made up this bunny pattern about four years ago when I wanted something special for Matt’s basket. I have been selling the pattern, but have decided this year to offer it to you all for free. If you knit one up we’d love to see it in our Flickr group. Gauge is not super important here you will just get a bigger or smaller bunny, this bunny is 7.5 inches tall including the ears. Just make sure it’s rather tight so you won’t see the stuffing though your knitting. Kfb – Knit into the front & back of the same stitch, increasing one stitch. Pull your cast on tail inside & weave it in. Also start stuffing the body, stuff it pretty tight to get the shape you want. Embroider or sew on the face at this point. The column that is six stitches wide is the back & the front is the area between the ssks & the k2togs. Then stuff & shape the head. Add any additional stuffing you need for the head. Cut yarn leaving about an 8-inch tail. Thread tail onto a tapestry needle & thread through the 6 stitches on the needles. Pull tight & weave in the end. Cast on 10 stitches. Divide evenly between 3 needles. Join together being careful not to twist. Place a marker between the first & last stitch to mark rows. Cut yarn leaving a tail. Thread tail onto a tapestry needle & thread through the 6 stitches on the needles. Pull tight & weave in ends. Cast on 14 stitches. Divide evenly between 3 needles. Join together being careful not to twist. Place a marker between the first & last stitch to mark rows. Cut yarn leaving a tail. Thread tail onto a tapestry needle & thread through the 4 stitches on the needles. Pull tight & weave in ends. Cast on 8 stitches. Divide evenly between 3 needles. Join together being careful not to twist. Place a marker between the first & last stitch to mark rows. Cast on 6 stitches. Divide evenly between 3 needles. Join together being careful not to twist. Place a marker between the first & last stitch to mark rows. Cut yarn leaving a tail. Thread tail onto a tapestry needle & thread through the 5 stitches on the needles. Pull tight & weave in ends. Put a little stuffing in the arms, legs & tail (a knitting needle can help push it into the arms). Using the pictures as a guide, sew each piece into place. The legs will help make the bunny stand on it’s own. 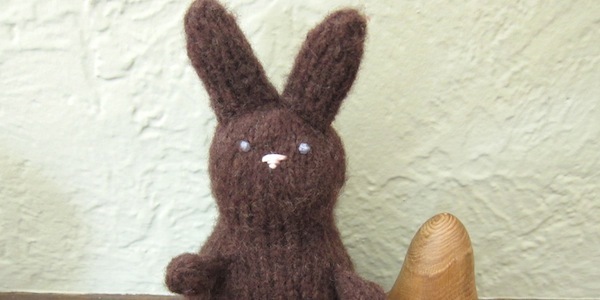 7 years ago by Kat in Easter , Holiday , Knitting , Knitting Projects , Needlecraft , Projects | You can follow any responses to this entry through the RSS feed. You can leave a response, or trackback from your own site. Very cute and guilt free! Very cute. Thanks very much for sharing your pattern. Very cute. Thanks for the no calorie chocolate bunny pattern. Would you by any chance have a pattern for a knit three hole ski mask for a boy age 11. I only have straight needles (no round ones). He is small for his age so a size or two smaller would work too. Laura – sorry I don’t have a pattern for what you are looking for. I would try looking on Ravelry. Thank you for sharing this pattern. I am going to make one for my sister who loves chocolate as much as I do…love the name! This bunny is oh so cute! I am totally making one. Also, I have begun to write a blog post with craft inspiration for Easter. May I please share one of your pictures? Of course I will link it back to this post.